The submarine Colorado is the fourth U.S. Navy ship to be named for the nation’s 38th state. The first Colorado was a three-masted steam-screw frigate launched at Norfolk Navy Yard in 1856. During the Civil War, Colorado was flagship of the North Atlantic Blockading Squadron and played a prominent role in the seizure of Fort Fisher in North Carolina. In the post-war years, the ship cruised on Asiatic Station; in 1885, the ship was sold to private interests and broken up. The next ship named for Colorado was a 13,680-ton armored cruiser launched in Philadelphia in 1903. In 1915, Colorado became the flagship of the Pacific Reserve Fleet, and a year later, was renamed Pueblo so that a larger ship could bear the name of the Centennial State. USS Pueblo escorted troop ships to France in 1917, and after the end of the war in 1918, brought more than 10,000 troops home to the U.S. The third ship named Colorado, the lead ship of the Colorado Class of battleships, was launched in Camden, N.J., in 1921. During World War II, the ship participated in the invasions of Kwajalein and Eniwetok in 1944 and later provided fire support for the landings at Saipan, Guam and Tinian. While off Tinian, Colorado received 22 hits from shore batteries, killing 43 men and wounding 198. A week after arriving in Leyte Gulf, the ship was hit by two kamikazes, which killed 19 of its crew. Colorado received seven battle stars for World War II service; in 1947, the ship was taken out of commission. Colorado is the 15th submarine of the Virginia Class – and with its sister ships – represents a revolution in submarine design, construction and mission capability. This versatile and powerful vessel will maximize the contribution the U.S. Submarine Force makes to national security. Colorado and the Virginia Class are among the most effective platforms in the U.S. Navy portfolio. Unobtrusive, non-provocative and connected with land, air, sea and space-based assets, these submarines are equipped to wage multi-dimensional warfare around the globe. The central characteristic of the class is the modularity derived from the design / build approach, which supports efficient construction and mission capability. This provides the U.S. Navy with a submarine class that advances the state-of-the-art with each succeeding ship. Colorado’s adaptability makes it highly responsive to changing mission requirements. Electric Boat, its construction partner Newport News Shipbuilding, and the U.S. Navy continue collaborating to reduce the cost of future ships while introducing new capabilities to ensure the ongoing relevance of Colorado and the Virginia Class. Our goal remains unchanged – to provide the U.S. Navy with the most sophisticated undersea warships in the world. Colorado will provide the submarine force with the capabilities required to dominate the open ocean and the littorals. In addition to anti-submarine, anti-surface ship and counter-mine warfare, Colorado will support surveillance, Special Operations and covert strike missions. Looking ahead, Electric Boat will continue to develop and refine innovative processes to reduce the cost of future ships while introducing new capabilities that will ensure the relevance of Colorado and the Virginia Class well into the future. 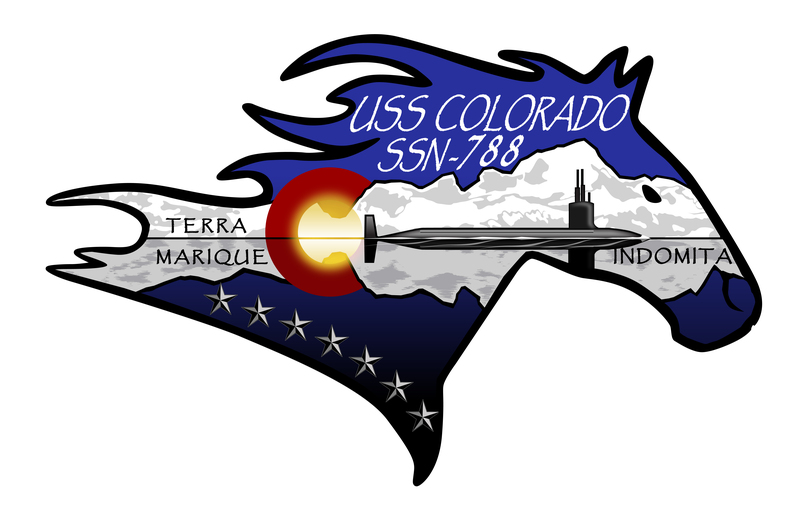 From late 2014 into early 2015, the USS Colorado (SSN 788) Commissioning Committee coordinated a competition to design the official crest of the USS COLORADO. In April 2015. after receiving over 100 submissions from all across the world, the Commissioning Committee and the crew of PCU COLORADO evaluated the submissions and ultimately selected the design of Michael F. Nielson, to serve as the ship's official crest. After the selection, the designer was contacted to provide some personal background information and finalize the design. It was at that time the command and the Commissioning Committee learned that the designer was both a naval officer and Colorado native who was completing initial training for the Naval Nuclear Propulsion Program, and had orders to report to PCU COLORADO. After completion of his training in October 2015, LTJG Nielson reported to PCU COLORADO as one of the first two Junior Officers.